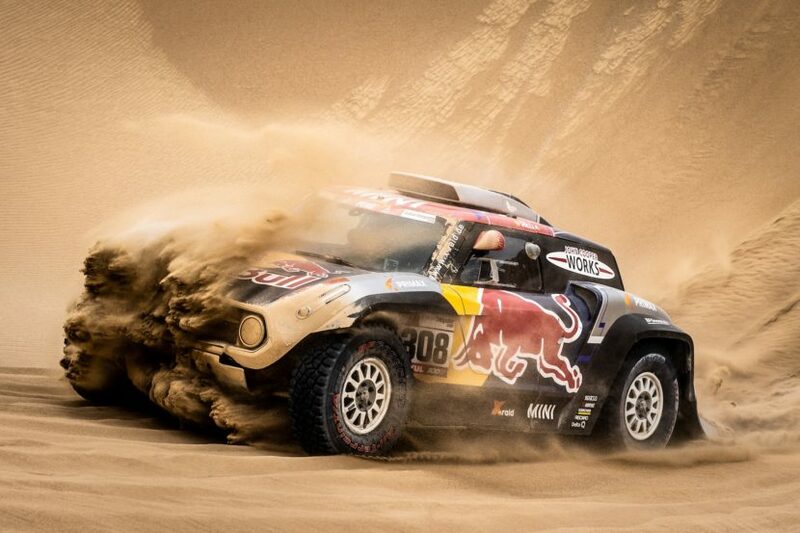 The penultimate stage of this year’s Dakar Rally was quite eventful, with a lot happening. The leader, Nasser Al-Attiyah set the pace in the ninth stage of the rally, claiming his third stage win of this year. After a crash ruled out Peterhansel for the remainder of the rally just 26 kilometers into the stage, it was Nani Roma who was placed best from the MINI crews, finishing second, just 4 minutes behind Al-Attiyah, straightening his lead of the third place driver, Sebastian Loeb, who had a rough stage. Sebastian Loeb led for most of the 312-km timed route around Pisco but in the end came in third as his Peugeot stalled in the final stretch. At the moment, he’s still looking set to be on the podium at the end of the rally, as he has a half-hour advantage ahead of the fourth-placed overall driver, X-Raid’s Jakub Przygonski. The second place is held by Nani Roma who sits about an hour ahead of Loeb and about the same behind the leader, Al-Attiyah. The final stage of the 2019 Dakar Rally will have the teams go from Pisco to Lima but will most likely see the standings unchanged unless the cars get seriously damaged and can’t finish for some unexpected reason.